-W.G. Sebald, as imagined being shown a Rorschach test by Mark O’Connell. And I am afraid, if Tor Ulven, one of the contemporary modernist poets of the Norwegian modernism, dominated by the likes of Paal Brekke and Erik Vold, was to be shown the same test, he would have replied in a similar fashion, except that maybe he would have proceeded to describe the abyss, and its soul-screeching darkness, as well. For Ulven was especially prone to the poetry of imagery- his poems never graced the political, but extensively the philosophical, and moreover, the philosophy of imagery. His poems, and, indeed, his “novel”, Replacement, variously called Relief and Succession, are all marked by his obsession with the image at play- the connection that he makes between words and images is what makes his poetry the “background noise of the universe,” as David Winters put it aptly in his review of the novel at Full Stop. The novel is more like anecdotes arranged around a vast canvas of a poem. That would tempt one to call it a prose poem and be done with it, but even that it isn’t, for Ulven’s obsession with the breathing space- let’s call it that- between images and the words that are required to bring it before the eyes of the reader establishes a peculiar relationship between what is seen and what is told- something Sebald also denoted, but in his own distinct style. He did not want to convert the imagery to the words, but show it in physicality by inserting enigmatic images in between the pages of his equally enigmatic books. Tor Ulven – Ulven meaning “wolf” in Norwegian- born in 1953, would never have any formal education, except for handling a crane, which was possibly his only source of earning money for, even though he was a poet who was in his lifetime considered an important product of the Norwegian modernist tradition, Ulven was somewhat of a poet’s poet- like Walser, a writer’s writer- who was read by other poets so as to acknowledge their own poetic structure, which is a considerable amount of respect, but respect doesn’t pay your bill, unless of course one can convert that respect into a moneymaking business, which Ulven couldn’t. He was a reluctant poet, someone who would be confined to his house and would sometimes peep out, only to view the landscape from his home and construct sentences, thread them together so as to make a poem out of it. Ulven travelled and walked great lengths – like Sebald did – for his literature, but he travelled through the complexities of his poetic mind and rested only to put to words what he had seen. This exhaustive mind play of his probably drove him to seclusion, and eventually into suicide in 1995, aged 42. Not much of his “actual” life remains for the public, and his legacy is rooted only into some of his poetry collections and an essay collection, in which he professes his love for blues music – he used to play at bars – European painting and, of course, literature. Replacement is his only attempt at the form of novel, as such, and even here he uses his words so as to form an image before us – albeit, an image which isn’t normal, but all the more unfathomable. Vilem Flusser, in his book-length essay, Towards the Philosophy of Photography, calls the images “significant surfaces”, signifying something which is “out there”, an arc which makes “that thing imaginable for us”. If Flusser’s theory is applied to Ulven’s photographic poetry, which I think it should be for better understanding; Ulven’s words are certainly constructing something which is “out there” (elegant clouds of dust). Flusser further expands that if one wants to give the image more than a fleeting glance, one should resort to scanning, which is what Ulven then offers (and you disappear more and more inside these hidden rooms, and your character fades out gradually…). The image of the room has already been presented, and Ulven then scans, so to speak, by letting us disappear and fade into it. Sebald would have dug through his archives to present before us an image of the Holocaust museum, an image so defeating that we, indeed, will disappear and fade inside it, but Ulven tries to create this fleeting image, and once that’s done, he appears to slowly back-out. Here, left to decipher the meaning of the image in which we are dropped, Flusser’s “synthesis of two intentions” comes into play, in which he asks the viewer, or the scanner of the image to deduce the meaning- one which “manifests in the image itself” while the other in the observer. The image itself, while second person comes into play, is us, while the silent observer, whose eyes scan his readers from the outside (he has bowed out, by this time, into abyss, of course) is Ulven. Another theory interesting in Flusser’s book, and applicable to Ulven’s creation of imagery, is his claim that the “glance may return over and over again to the same image element.” This image element is Ulven’s du– us. He keeps returning to the second person, and tries to lead us into the image, then back-out and keep scanning us, glancing at us. Ulven repeats the cycle, and keeps framing us within his poetic images, thus making his readers the subject of the poetry they are in the process of reading. Ulven, in short, tries to make us understand something which even the most complete human being cannot- us. Tor Ulven was a committed to the prose and poetry of the abstract, and he wrote keeping in mind the workings of the time and space, so as to create something magically beautiful. That breathing space between what has happened and what is to happen is where Ulven concentrates, like at the beginning of Replacement, when he calls his subject the “darkness’ friend”, the “short dark period, that is, after the curtains have been drawn, but before he turns on the reading lamp,” is where Ulven focuses his attention, is where his subject’s soul is being searched. This is the metaphysical aspect of Ulven’s words, which creates the sound in the silence which persists within a moment, and he manages to grasp that little, tiny moment and create a spectacle out of it- as in lifting up of a stone (stone features in a lot of Ulven’s verse, including the collection Forsvinningspunkt or Vanishing Point, where he asks the readers to “be stone/ or the loving hand that grasps the stone/ under water”). The idea of the stone, or the lifting up of it- if I am not looking too much into Ulven’s intentions- is to let go that compressed space in between land and stone, the moment Ulven has been writing about all his life, creating images out of it and leading his readers into it so that he can stand back and observe. The imagination which he puts into building such an atmosphere for his readers is astounding, as in the speculation of lightning giving life to the man in the X-Ray, which he established in Replacement. The constant hum in that novel holds hostage our ears, and before we know it, Ulven has pulled off the art of creating sound and image through language- all the more sensual part of literature not many could manage. Indeed, in the introduction to the only interview he ever gave in Vagant magazine, the magazine describes his language as the language never before seen- unheard of in literature. The formation of this peculiar language may be due to his observation of the European art scene- he did write about a few artists in his book of essays, like Sebald did in A Place in the Country– and the inspiration he derived from that art was evidently powerful, allowing him to concentrate his language on the vividness of his photographic poetry. Ulven, like most literary giants, believed that the art is greater than the life, and for such an art to become achievable, it is important that man must suffer, and that suffering be involved, entwined in that art so that it can achieve greatness. He paid a high price for believing in such an art, and this, too, was like most literary giants, but eventually all that mattered was the belief in the art, and its complete achievement. This art, Ulven believed, could only be achieved by utmost commitment to the creation of it- and that once it is created, it should speak. Which is one of the reasons why Ulven gave only one interview in his life. For him, it is important that the writing be the speaker, not the writer. In the Vagant interview, Ulven quotes Jon Fosse, calling the interviewer the controller of the interview. Ulven never liked being controlled; he wanted to be the controller of his speech, his voice. And that way he achieved what he wanted, with the lushness and expanding style of both his verse and his prose, his was a controlled vision, condensed within a philosophy not many poets could achieve- mixing nature and the gloom of existence, steering clear of the politics of that time (although that’s not to suggest Ulven did not know of the political or cultural developments of Europe or the World in general, as testimonies from some of his friends suggest) and writing about the power of and our existence in the nature, it would be a daring, not to mention gushing claim that Ulven invented his own kind of philosophy, but it won’t be wrong to say so. 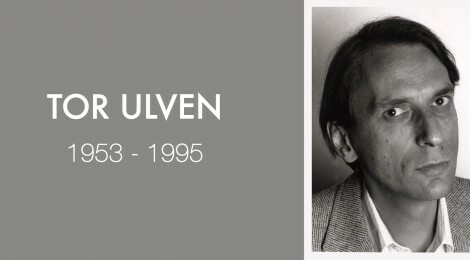 Because Ulven believed that writing should not be overshadowed by other arguably menial treatises, such as the life of the writer, I, too, did not make Ulven as a subject, but tried to place completely his work and the complexities of it in its place. His work lets us know that he has created an image, gently led us into it- all the while unknowably nodding towards Flusser – and then has proceeded to observe us closely. The universe is a complex thing, but poets like Ulven help us identify with it, make us listen to its sound and create a tragic portrait of its ever-expanding image. Tor Ulven spoke an unheard language, but miraculously enough, we all could listen, speak, read and understand it.